Please note that code entry is only possible when "CODE" is shown in the display. If the unit is codelocked it will need to be left switched on up for up to two hours to reset before another code entry attempt is possible. If it does not reset after this time, or the display shows "OFF" then all of your code entry attempts may have been used up, and the unit will need to be sent to us to be decoded and reset - details of which can be found below. 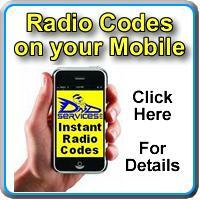 If you have lost your radio code, the Security Code for this Radio is available NOW using our fully automated INSTANT RADIO CODE service. Once your Radio details have been submitted, your Code will be ready - Instantly !! - No Waiting !! Removal of the radio is fairly straightforward. This radio is bolted in place by four bolts, and these will be hidden beneath the dashboard trim. Removal of the trim will depend largely on the vehicle it is fitted to, but should not present any real problems. Please consult your service manual if you are unsure how to go about this. Once the four bolts that secure the radio frame have been removed, the stereo will come out in a rather large lump and can then be unplugged.